It worries me when art critics don’t surround themselves with art – it’s like coming across a music critic who doesn’t listen to music at home. As if work could possibly be separated from leisure when it comes to the arts. The half-hearted are the dangerous ones, those who fancy themselves as cultural commentators or historians of ideas and constantly quote Barthes and Bachelard, not to mention Guy Debord or Georges Bataille. Art-less art critics produce in me the same sense of deep unease as writers who speak of ‘the paper-less office’. Where’s their grip on reality? My writing room may be crowded out with books and files and pictures, but at least I can check my references in books people have taken a great deal of trouble to produce, rather than the hastily loaded data of a computer screen. Art is of course much more than a matter of facts, it is about intelligent connecting, and the primary experience for the viewer of the visual arts is just that – viewing. Standing in front of the work of art and receiving the impulses and sensations that come off it. It’s like looking at an old building or a beautiful landscape, except that a lot of people seem unable to do it without blinding themselves first with prejudice. The best way to look at art has always been with an open mind, an open eye and an open heart. If you can avoid preconceptions, you’re in with a chance of actually experiencing some of the joy and beauty (or horror and disquiet) that the artist is attempting to convey. As a collector, you have the choice of what to surround yourself with and what to learn from. As I have collected pictures over the years, always unfortunately with a limited budget, certain categories of interest have emerged. I love landscapes, yes, but paintings of trees in particular; then there’s 1950s abstraction and self-portraits. I was inspired to collect artists’ self-portraits by the example of Ruth Borchard (1910–2000), who began her own collection of 100 of them in the late 1950s. She wrote to artists offering to buy a self-portrait for anything between seven and 21 guineas, and was remarkably successful in her efforts, eliciting work from the likes of Roger Hilton, Keith Vaughan and Cecil Collins. The Borchard Collection offers a kind of chronicle of the period through the varied styles of some of its artists, and is endlessly rewarding for its inclusions and juxtapositions. The exhibition I have selected for Gainsborough’s House focuses on some sixty portraits and self-portraits from my collection and spreads the net a bit wider. I have bought pictures by artists I never met, but long admired, like Augustus John and Walter Sickert, David Jones, John Nash and Wyndham Lewis. Then there are works by artists I’ve known and written about: Eileen Agar, whose autobiography I helped to write back in the 1980s; John Bratby, whose biography I started but abandoned when I realised I was not cut out to be a biographer. A long-standing interest of mine has been to re-direct public attention to artists who, for one reason or another, have been unfairly neglected. 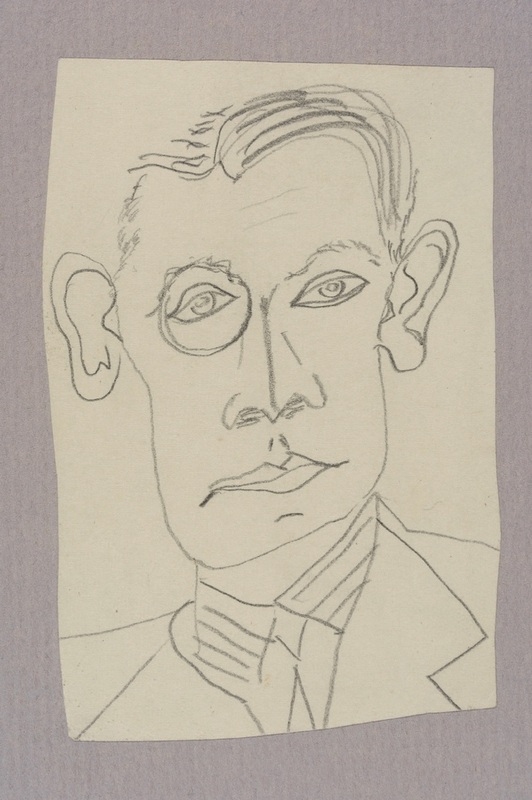 Jacob Kramer (1892–1962) is one of these, a Leeds artist of originality and power, who was tangentially involved with the Vorticist movement (his brother-in-law was the artist William Roberts), but is better known as a distinctive realist painter of impressive range. He is represented in this show by a large self-portrait ink drawing and two pastel and chalk portrait drawings; all repay close attention. Then there’s William Dring (1904–90), largely forgotten these days, though once a stalwart of the Royal Academy. I have several of his landscape and flower studies, and show here a remarkable oil from his student period of the young artist in the act of painting an old man with silvery locks. Youth and age incarnate. Among contemporaries who have not received their due are Michael Carlo and Mike Harvey, both inventive artists doing new things within the tradition of realism. Even some of the older statesmen of British art such as Jeffery Camp, Anthony Eyton and Keith Grant, although well loved and respected among their peers, are not as widely known as they deserve to be. To balance the equation we have the justly celebrated Leon Kossoff and Maggi Hambling, Allen Jones and David Inshaw. And some mid-career artists, including Arturo Di Stefano, Robert Dukes, Sam Marshall, Martha Parsey, Mark Shields and Jo Welsh: all of them offering valid and beguiling interpretations of the human countenance. I first went to Gainsborough’s House, the country town house in Sudbury, in Suffolk, where the painter Thomas Gainsborough (1727–88) was born and which is now a museum to his art and life, back in the 1980s in the company of Jeffery Camp. It gives me great pleasure to return there now in Jeffery’s company once again (he is represented by a self-portrait and a portrait of his wife, Laetitia Yhap), and with other artist friends, living and dead. I have learned more from artists and their works than from any book, however enlightening. And their companionship has made it easier both to endure this world and to enjoy it. Face to Face: Portraits from the Andrew Lambirth Collection is at Gainsborough’s House, Sudbury, 11th June–16th October.